The woman suffers ongoing shoulder pain and had to leave her job as a result of the incident. A 59-YEAR-OLD Co Dublin woman has been awarded €55,000 damages in the Circuit Civil Court after she slipped and fell on yoghurt in a Tesco store four years ago. The woman suffers ongoing shoulder pain and can no longer lift her grandchildren as a result of the incident. Dee Kenny told the court that in April 2012 she had been shopping in Tesco, Ballybrack, Co Dublin, when she slipped on yoghurt and fell on her right side. Kenny said she suffered immediate pain in her right hand and hip. She had been shocked and embarrassed and had been helped up by her son and a customer. She had gone home after talking to a Tesco duty manager. She told her barrister, Kieran O’Callaghan, that her hand and hip had been very sore the following day and she had gone to St Columcille’s Hospital in Loughlinstown, Co Dublin. The court heard that X-rays revealed no fracture. Kenny, of Watson Drive, Killiney, had suffered bruising to her hip and a sprain to her right thumb. She said she developed pain in her right shoulder a few weeks later. Following further medical examinations, an ultrasound had revealed that she suffered a tear to her shoulder rotator cuff. The court heard the accident had exacerbated a pre-existing degenerative condition in her shoulder. Kenny told Judge Francis Comerford that she had given up her job as a laundry operative because of ongoing pain in her shoulder. The court heard that she underwent surgery last year. She said she was attending physiotherapy sessions and her pain was expected to improve. Kenny said her life had been affected by her injury, as she could not lift her grandchildren and had to give up her swimming activities. The court heard that Kenny needed to take antidepressant medication. She sued Tesco Ireland Limited for negligence. Mr O’Callaghan said the store accepted the accident had happened and Ms Kenny’s case had become an assessment of damages only. The store claimed that Kenny’s shoulder injury was due to the degenerative condition and was not related to the accident. Judge Comerford, awarding Kenny €55,000 damages, said he was satisfied her shoulder pain had developed a few weeks after her fall. 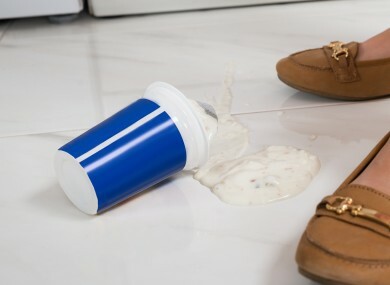 Email “Woman awarded €55,000 damages after slipping on yoghurt in Tesco ”. Feedback on “Woman awarded €55,000 damages after slipping on yoghurt in Tesco ”.